Everyone experiences moments of disconnectedness or anxiety. 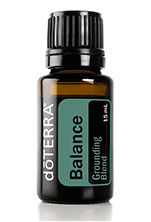 The warm, woody aroma of Balance, dōTERRA®'s grounding blend, creates a sense of calm and well-being. We perfectly blend Spruce needle/leaf, Ho wood, Frankincense, Blue Tansy Flower and Blue Chamomile Flower essential oils in a base of Fractionated Coconut Oil to offer an enticing fragrance which promotes tranquility and a sense of balance. For aromatic or topical use.